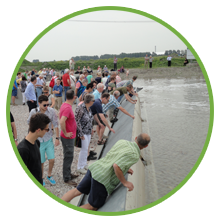 The Vlotterkering® is the innovative design entered by Gerard Jansen and Jan Vermond into a competition for a temporary water barrier for the emergency reservoir in the Woudse polder in Midden-Delfland. This European competition was organised in 2006 by the Water Board of Delfland. The jury was chaired by Prof. J.K. Vrijling, professor of hydraulic engineering at TU Delft. The aim of the competition was to encourage individuals and companies to contribute their ideas for a temporary embankment of 1,150 metres that met all the specific site requirements and safety requirements. The Vlotterkering® was one of 56 entries, and was awarded first prize on 5 July 2007.